The Eight-Tails is a tailed beast sealed within Killer B of Kumogakure after his cousin, cousin's uncle and cousin's father failed before him. Since Killer B is one of the few jinchuriki to gain control over his tailed beast, his relationship with the Eight-Tails is very relaxed. Where the Nine-Tailed Demon Fox constantly threatens its jinchuriki and must be either restrained or confined to be spoken to, B and the Eight-Tails can talk leisurely, with Killer B even sitting on its nose. However, B tends to annoy the Eight-Tails to comical effect; his serious and no-nonsense demeanour often contrasts with B's tendency to goof off whenever he likes, adding fuel to the Tailed Beast's irritation to his vessel. The Eight-Tails is not above bad-mouthing B as a result. The Eight-Tails is also known to scold him in serious occasions as shown when it criticised B for rapping in his fight with Kisame when he should have been completely focused on their opponent. Because of this, the Eight-Tails appears to be much more note worthy than B as far as responsibility is concerned. Before B learned to control it, the Eight-Tails was infamous to be wild, and violent. It also went on many rampages whenever its former jinchuriki would lose control of it. Despite the Eight-Tails' strong relationship with Killer B, its main goal, like the other beasts, is self preservation. For example, it was more than willing to be released and attack Kisame Hoshigaki despite Sabu and Ponta being close by. The Eight-Tails is also shown to have a good analytical ability, as it told Killer B that if he left Ponta and Sabu and run in the opposite direction Kisame and the water will follow him and they (Sabu and Ponta) would be freed. The Eight-Tails mentioned that it used to be much more aggressive and violent but that Killer B changed it. It also said that it doesn't like the Nine-Tails but insisted that was no reason for B to refuse to help Naruto take control of the beast, hinting a benevolent side. Since then, both the beast and B have taken a liking to Naruto. The Eight-Tails also tends to reprimand B. This is usually shown in a comical manner as when it bumped B in the head when the latter started to mention in a perverted matter how Yugito's chakra receivers where embedded in her left breast. 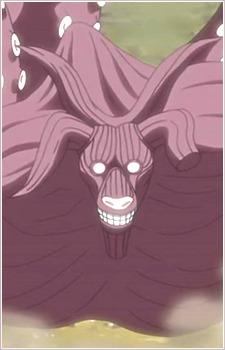 With regards to its relationship with the other tailed beasts, the Eight-Tails maintaining that they had their own emotions and personalities has expressed dislike of the Nine-Tails' habit of ranking their strength based on their number of tails and has also stated that seeing another beast being forcefully controlled angered the rest of them greatly.